Today’s Entertaining with Style post is all about cooking sous vide and we’re featuring the Sansaire cooking brand. 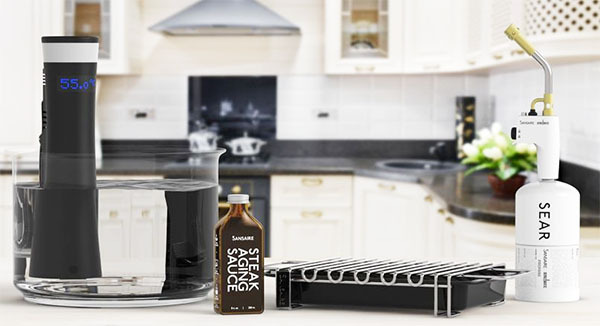 Sansaire’s technology is changing the way people cook at home, making traditionally professional-grade cooking tools available to the home chef. 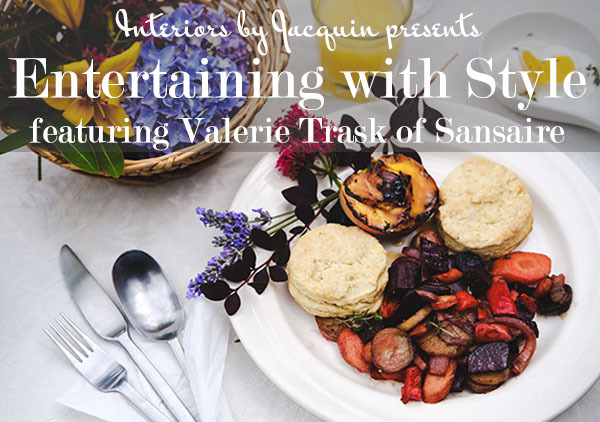 Valerie Trask, Chief Operating Officer and co-founder of the company, shares one of her recent culinary adventures with Interiors by Jacquin blog. and a Searing Kit with a blow torch and searing tray. While fancy restaurants have been using this technology for years, we helped make it accessible to home chefs. 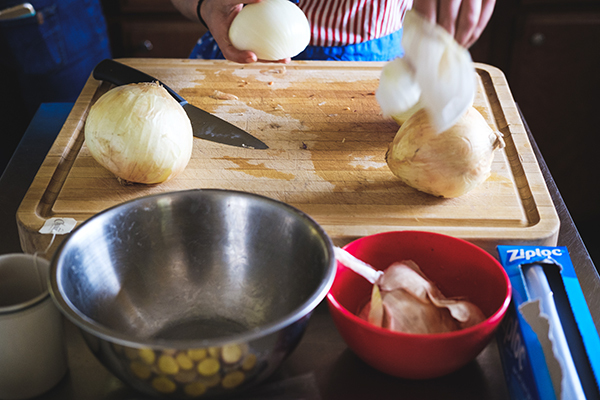 This method takes the guesswork out of preparing perfectly cooked meals. 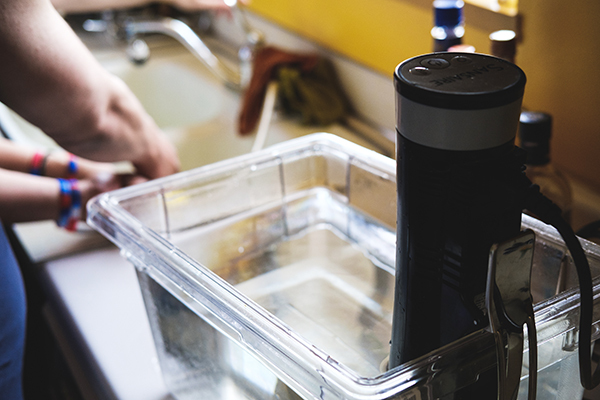 By maintaining a constant and exact temperature, Sansaire sous vide device makes cooking time less important. Not to mention it’s ideal for hosting because with a sous vide device all of the preparation work can be performed well before guests arrive. 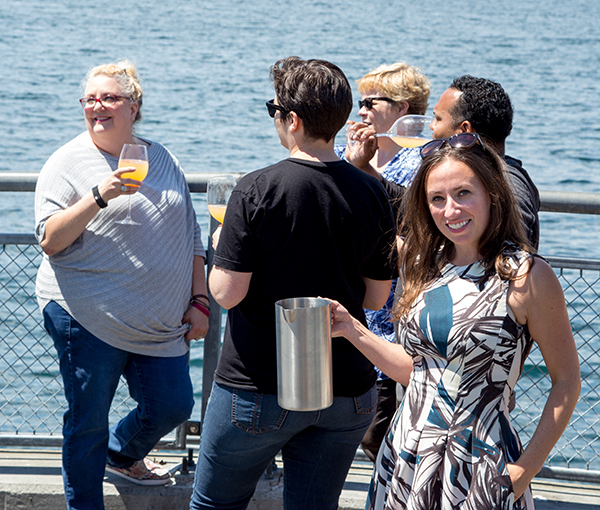 Hosts can finally focus on their guests instead of meal preparation, which helps us all to be the relaxed hosts we truly want to be. 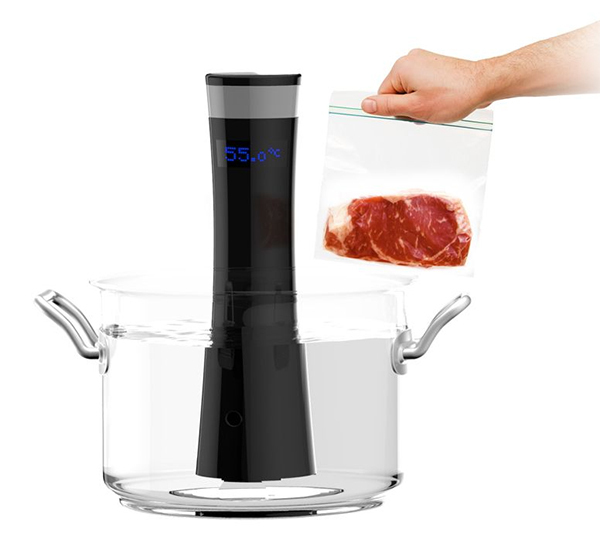 “Sous vide” is French for “under vacuum” and refers to the process of vacuum-sealing food and cooking it in a temperature controlled water bath. The intent is to cook the item evenly, ensuring that that the inside is properly cooked without overcooking the outside, all while retaining the food’s moisture. Every summer, myself and a group of 10-20 hyper-urban Seattleites flock to a cabin in a small town to play like the locals and eat like the kings. 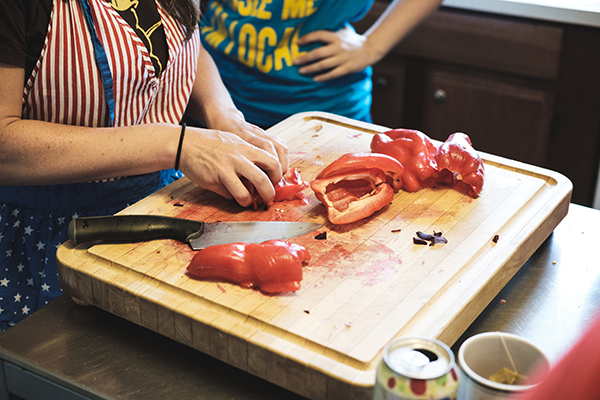 While cooking is not officially competitive, we divide and conquer meal preparation and people go big. To add to the challenge, our combined food allergies and preferences along with the sheer volume of people is a feat for us all as cooks. 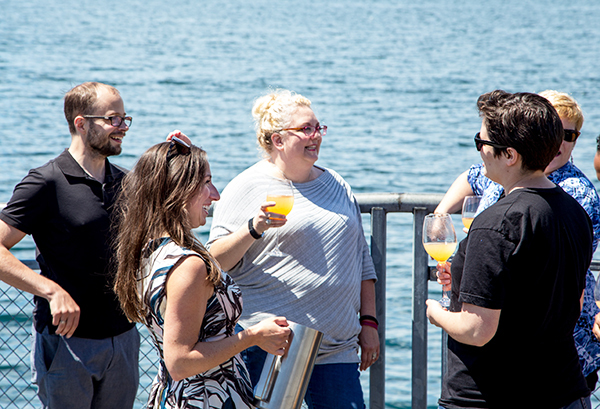 Typically my dinner parties are no larger than eight guests, but for a group of our size we alternate hosting the meals on fun trips like this one, which allows time for relaxation in between preparations. Like any proud co-founder, I wanted to show off the breadth of Sansaire’s cooking devices while preparing a meal that anyone could enjoy, which meant that I had to be sensitive to vegetarianism, lactose-intolerance, and gluten allergies. No problem! My menu and advanced cooking tools made this complicated task completely do-able. This year for our group dinner we rented an adorable home on Orcas Island, in northern Washington State. They say that constraints breed creativity, which was certainly the case for this trip. The ferries to the island were overbooked, so our group maxed out our ability to carpool, therefore, forcing us each to pack modestly. For me, that meant I wasn’t able to bring tableware and table décor. Instead, I was forced to wing-it and rely solely on what I could find. I was pleased to discover that the outdoor table was nestled into a small clearing in a gorgeous garden of lavender and roses, which was all surrounded by wildflowers and tall grass. Bingo! 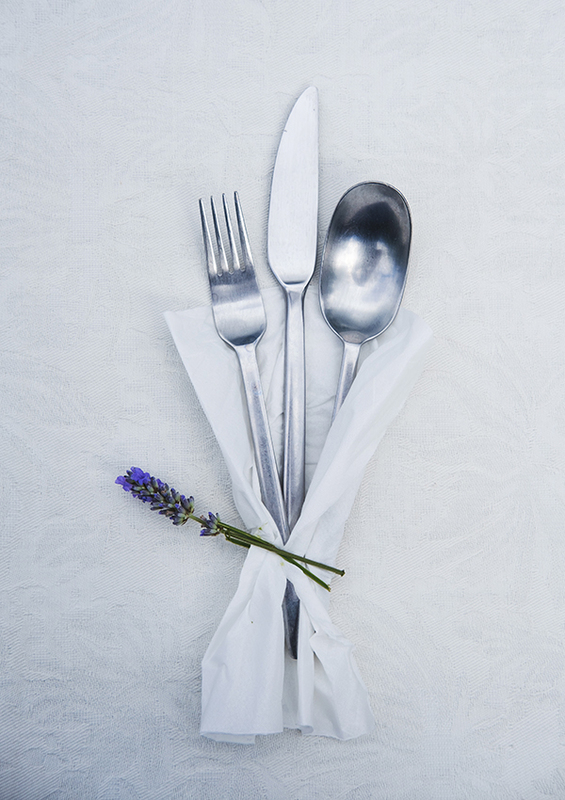 In addition to a colorful bouquet of fresh flowers from the garden, I was able to use lavender stems as napkin holders, a sheet as a tablecloth, and wildflowers as a decorative plating accessory. 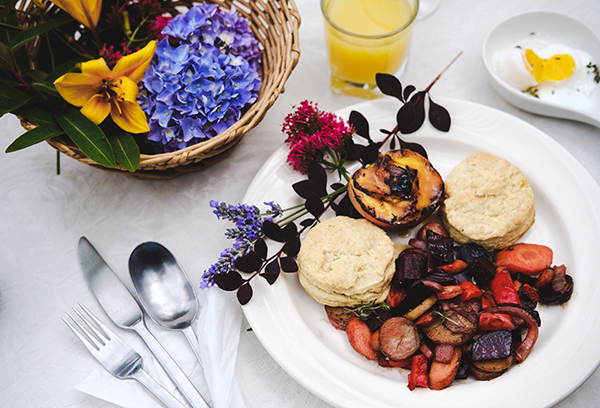 The white tablecloth, the colorful foods, and the bright flowers came together terrifically. Everyone was blown away by the presentation, especially knowing that it had been pulled together with limited resources. Quite the success! I prepared a sous vide veggie hash the night before. This way, the morning of I could enjoy a more relaxed pace. 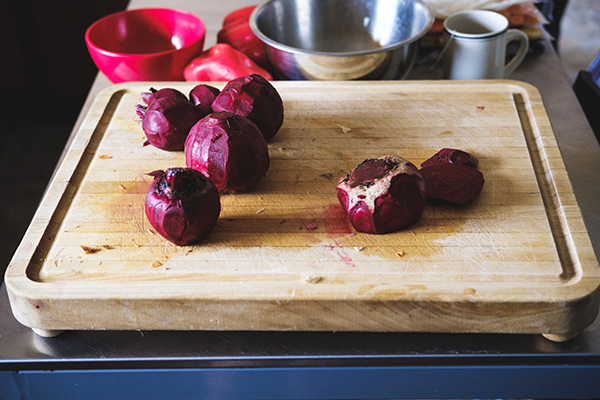 I worked with a wide array of brightly colored vegetable colors ––each of which I wanted to maintain its own integrity––so I prepared beets, carrots, onions, and two different potato varieties all separately. In an effort to maintain some textural diversity, I left the red peppers raw and crunchy, but used the Sansaire Searing Kit to blacken the skins. Aiming for sweet-but-seasonal, I used the Searing Kit to brûlée the peaches. It was a simple way to incorporate fresh fruit, yet show creativity. As a 5’1 girl who wears dresses daily, I always love busting out a blow torch at dinner parties! Making the brûlée peaches was the easiest aspect of the meal, but it garnered me the most style points. Using a searing kit really adds wow factor to your meals, especially when you want to impress guests. Cooking eggs for twelve people would normally be a stressful task, but I prepared 24 eggs by simply cooking them sous vide in their shells for 23 minutes at 72 degrees C/161.6 degrees F. The result was a medium firmness velvety texture, which is harder to achieve than expected without a sous vide device. I don’t usually venture into mixology; but there’s a first time for everything so I expanded my horizons with a unique breakfast cocktail. 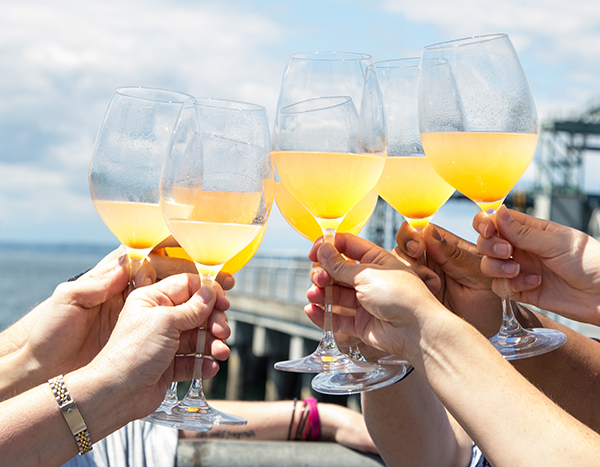 I sous vide cooked and blended lychees, combined with sparkling wine to make a phenomenal mimosa. I made fresh buttermilk biscuits with my grandma’s fresh blackberry jam to round out the meal. Here’s how to make my Brûlée Peaches! Cut the peach in half, remove the pit, sprinkle with raw sugar, and torch the top until you reach the desired crispy amber color. Serve as is or top with vanilla yogurt or ice cream and a dash of cinnamon. It’s that simple! If you’re looking to impress your family and friends with gourmet quality meals, Sansaire’s cooking devices will certainly assist you. 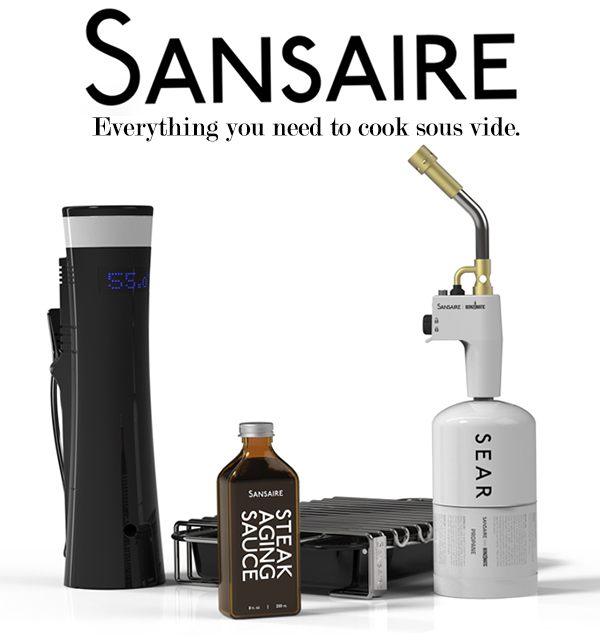 Visit the Sansaire website to learn where you can purchase Sansaire’s Sous Vide cooking device and Searing Kit.